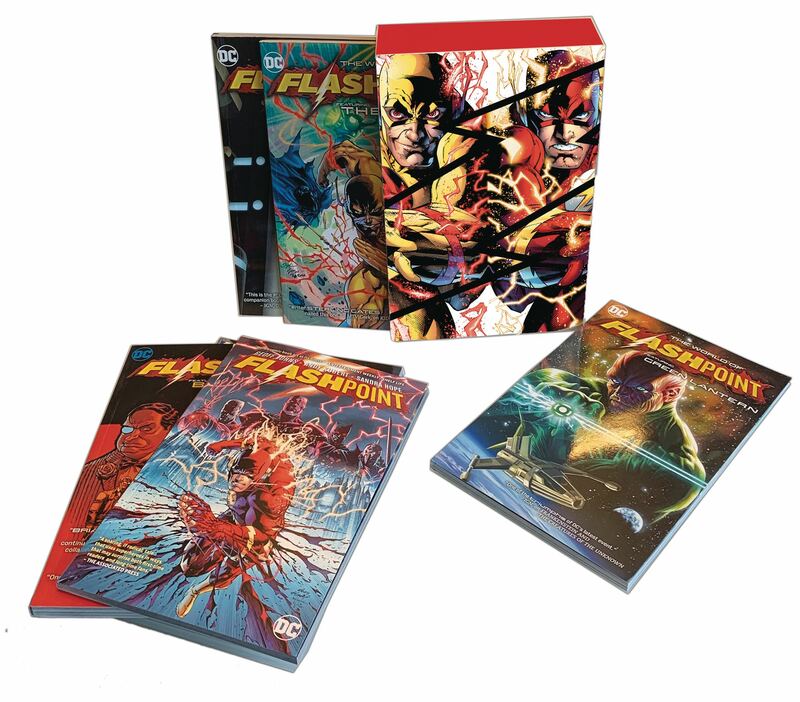 This collectible slipcased box set features the complete FLASHPOINT epic, from the legendary miniseries by writer Geoff Johns (DOOMSDAY CLOCK) and artist Andy Kubert (THE DARK KNIGHT III: THE MASTER RACE) to the entire run of titles by comics' greatest talents exploring the world of FLASHPOINT through the lives of Batman, Wonder Woman, Aquaman and more. When Barry Allen wakes at his desk, he discovers the world has changed! Deceased family members are alive, loved ones are strangers and close friends are different, gone or worse. It's a world on the brink of a cataclysmic war between the Atlanteans and Amazons-but where are the World's Greatest Heroes? It's a place where America's last hope is Cyborg, who hopes to gather the forces of the Outsider, the Secret Seven, S!H!A!Z!A!M!, Citizen Cold and other new and familiar-yet-altered faces! It's a world running out of time. If the Flash can't find out who altered the timeline, the DC Universe is doomed! This collector's box set includes these trade paperbacks: FLASHPOINT TP FLASHPOINT: THE WORLD OF FLASHPOINT FEATURING BATMAN TP FLASHPOINT: THE WORLD OF FLASHPOINT FEATURING GREEN LANTERN TP FLASHPOINT: THE WORLD OF FLASHPOINT FEATURING THE FLASH TP FLASHPOINT: THE WORLD OF FLASHPOINT FEATURING SUPERMAN TP FLASHPOINT: THE WORLD OF FLASHPOINT FEATURING WONDER WOMAN.